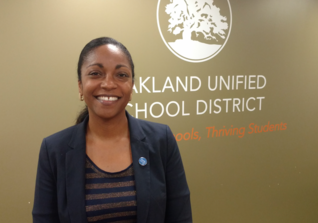 Congratulations to Dr. Kyla Johnson-Trammell, who has been named the finalist for Superintendent of the Oakland Unified School District. There is a palpable sense of excitement in Dr. Johnson-Trammell being selected as a finalist as she represents the best of the GO network’s aspirations for a leader that is homegrown, with experience as a parent, teacher, and principal. We are excited about the promise and experience that Ms. Johnson-Trammell brings into the role as the leader of our education community. While students in Oakland have made a lot of progress, there is more work to be done to ensure all students graduate prepared to thrive in college, career, and life. To that end, we hope that Dr. Johnson-Trammell will be the leader who brings our community together with a renewed focus on improving quality, equity, and sustainability within and across all public schools in service of all students. With an increasingly difficult budget environment in the years to come, our community needs Dr. Johnson-Trammell to narrow, refine, and build buy-in for the district’s strategy to improve student outcomes and to reimagine our district budgeting process. Hard choices must be made, and done right, they will include school leaders and community members in the conversations to ensure that the budget reflects our values and priorities for our students. The measure of Dr. Johnson-Trammell’s success as superintendent will be the progress that our students make toward goals that have remained too distant for too long. In the weeks and months ahead it is important that the community reach out to lift up Dr. Johnson-Trammell and ask what we can do to support her as she leads our district in the work ahead for students.